For one of my college classes I was assigned to write a summary paper on a peer reviewed journal article. 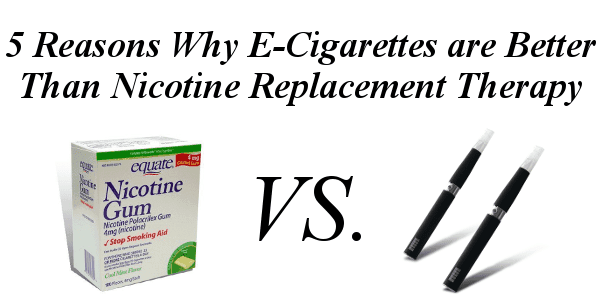 Since I love e-cigarettes, I found an interesting article titled ‘Perceived efficiency of e-cigarettes versus nicotine replacement therapy among successful e-cigarette users‘. In it they studied people who had quit smoking with e-cigarettes but had previously been unsuccessful with other Nicotine Replacement Therapy (NRT) methods including Varenicline, nicotine gum, and the nicotine patch. The study consisted of 11 people, 9 men and 2 women between 18 and 64 years old. They all had been smokers for 1 to 40 years, and all of them had failed to quit smoking with a NRT method. The study was based on survey responses and study groups. The participants reported little success in previous attempts to quit with traditional NRT methods. They still craved cigarettes and most would usually end up relapsing. They all had bad experiences with the NRTs because a number of negative side effects. Some reported that the NRTs fulfilled the physical need for nicotine but not the psychological desire to smoke. After talking to participants and going over their records, the researchers found 5 main themes or benefits of e-cigarette use. These may explain why users have been able to quit with e-cigarettes while failing with other NRT methods. Users said that e-cigarettes closely mimic smoking. This includes the feeling of the vapor hitting you throat and exhaling a vapor cloud. They also reported that they were able to keep some of their smoking routine, such as vaping (instead of smoking) with their morning coffee. Users talked about the significance of having a community of vapers through online forums where people can talk and ask questions about vaping. There are a ton of people online that will help get you started and help keep you vaping rather than smoking. Many e-cigarette users reported that it’s become a hobby for them. They spend time looking for new e-liquid flavors and different devices to use. Others like to collect the different types of vaping devices. The majority of e-cigarettes users now call themselves “vapers” when previously they had been called “smokers”. The e-cigarette gave them another identity instead of just being somewhere between “smoker” and “ex-smoker”. E-cigarettes allowed them to quit smoking, but some were not ready to quit nicotine. Since users see e-cigarettes as safer than smoking, some are not in a hurry to quit nicotine completely. This demonstrates that e-cigarettes can be very useful in helping smokers, however more research is needed. There are 5 main reasons why smokers perceive e-cigarettes as a better option than other NRT methods. This shows that there is a need for health practitioners and policy makers to not think of smoking as just a physical addiction to nicotine but a complex addiction with physical, behavioral, and social aspects. I hope researchers will continue to study e-cigarettes and all of their potential benefits. You can read the full e-cigarette VS NRT study here. Switching to electronic cigarette is indeed a safer alternative to tobacco smoking. E-cigarettes allow people to experience the freedom to smoke, but pose fewer health risks than that of traditional cigarettes do. Thank you for sharing informative article. This will surely help a lot of people to better understand the reasons why e-cigarettes are more effective than other NRT methods. I dipped snuff, for me vaping was a way to kick a 45 year habit. I don’t think its all about the hand to mouth psychological aspect of smoking that folds over into vaping. I quit cigarettes 20+ years ago, I quit my pipes probably that long ago, quit cigars about 3 or 4 years ago when they started giving me migraines. For me it was the nictine I needed, when I first started vaping I found a place where I could get 34mg or 36mg nic juice, it was the highest concentration of nicotine I could find. That was July last year, maybe August, I’ve been vaping a relatively short time compared to a lot of people i have met on line and locally. I am now down to 0.6mg nic level, I recently have started rebuilding coils, and have met a lot of great people on line and in person, this a lifestyle for me now, a lifestyle I have embraced whole heartedly. I know since i quit the dip in January of this year, my last physical was in July, I am much healthier, I feel better, my taste is back and I’m not getting all nervous and jerky that I don’t have a can of dip on me. I’m glad to hear that you have given up on all tobacco. I know when I was selling e-cigarettes in 2009 36mg strength was very popular, now it seems 12mg strength is most common. I think it’s due to devices producing more vapor per drag. I agree Nathan, my buddy runs a small vape shop nothing much but I do get some of my juices from him. I’ve noticed, at least here in little old Vero Beach, FL.and my buddies shop, 12mg. and 18mg is still popular. From what I see the ones who get 18 and 24mg are the ones who have recently quit smoking, however being that we are a small town our choices are limited. Do you shop online, or….head to Orlando which is a w hour drive and go to u our favorite vape shop for your premium juices. I’m in Orlando once a month so I try and leave a bit early and hit one of my 2 favorite shops there. I might have to alter my plans and go after my appointment but I try and hit at least one shop. I have noticed the few times I’ve made it to Vapin in the Cape 6mg or 0.6mg however ya want to put it seems real popular in some of the larger metro areas. Most cloud chasers or even drippers can’t use anything over 6mg or they get too much nicotine. I know, I was speaking in general terms. I just got my first rebuildable a Russian 91% clone. Its nice and all, but the tank is way to large. I can go through that 4.5ml tank in less than a day. I use 6mg. juice in mine…I think thats about all I have is 6mg nic level in all my juices I have 4 that I use regularly, but due to cost and until I can find a smaller tank, maybe one of your links I will, my Russian will have to get put aside. I get great vapor with a 1 ohm coil, but I go through juice at a phenominal level. Way more than I do with even my Aspire Nautilus or my Kanger Aero Tank Mega. Thank you for all you do here, this is a great site, and I have seen a lot of great deals here, just wish i was rich instead of good looking lol.